For active people with a keen life attitude, eager to invest in a real estate, career-minded or just beginning a career, 2MENGROUP company offers the conceptual residential complex FiftyFifty. Everything in the residential complex, beginning with the color of the facade and ending with ergonomic space of the apartments, is subject to one conceptual principle – to provide everything for a dynamic life and everyday living. The house fulfills all the criteria of a business-class complex: central location, advanced infrastructure, German engineering, floor-length translucent constructions (floor-to-ceiling glazing), wooden windows, ceramic bricks, silent high-speed elevators, video control-system, underground two-level parking with power-operated parking system, designed entrance lobbies, architectural building lighting. It is planned to have the following in the complex: supermarket, optometrist, bank, and different shops – from children’s clothes to special goods. The name FiftyFifty originates in the well-known phrase “Fifty Fifty”. A good house is half a success in the life of every person. Providing secure and highly-organized living, FiftyFifty provides an opportunity to realize life aspirations by focusing all efforts on one's own promotion. Due to the residential complex location and effective transport junction you will always be in the proper place of the business center, which is the key to success in the modern world. 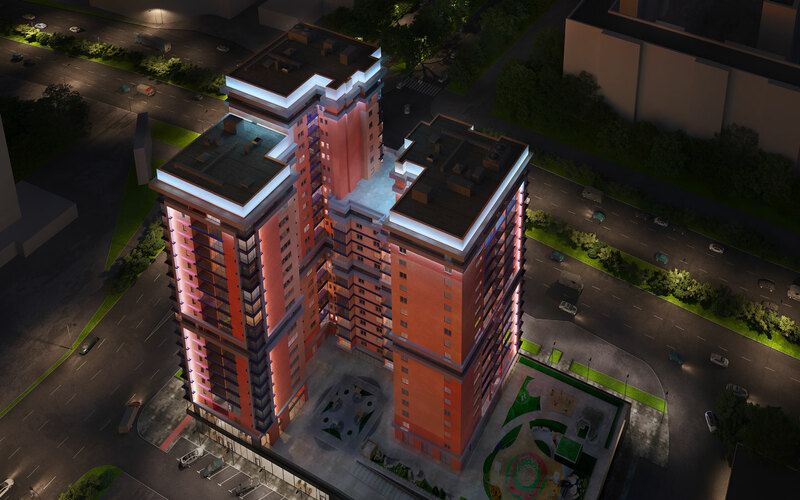 Conceptual residential complex FiftyFifty - one half of your success!